The 2012 election cycle highlighted a significant and troubling trend in our democracy: states across the country passing laws that would keep many Americans from participating in the political process. We witnessed states enacting restrictive voter ID laws, purging voter rolls, limiting early voting and polling-place hours, and redrawing congressional districts in a way that limits fair and equal participation in the political process. Because of these efforts, as well as fundamental shortcomings in our election administration system, many Americans had to wait in line for hours to cast their ballots in the 2012 election. These voter-suppression measures had a disproportionate impact on people of color, low-income voters, and the growing Millennial population. Post-election studies indicate that African American and Latino voters had to wait in line nearly twice as long as white voters. The ability to cast a ballot came under attack in all corners of the country. Americans, regardless of political affiliation, are concerned about whether their most cherished right—the right to vote—will be honored on Election Day. Efforts to discourage voting not only undermine democracy by making our government less representative, but they also make citizens question the integrity of our democracy. During the 2012 election, voters in nine states and dozens of additional local jurisdictions were protected by the preclearance requirement of the Voting Rights Act, which prevented their governments from implementing changes in voting if racial or language minorities would be disenfranchised. Section 5 of the act required those jurisdictions with a history of racial discrimination in voting to ask either the U.S. Department of Justice or a court in Washington, D.C., for approval before making any changes to voting laws—a process known as “preclearance.” Section 4 of the act established the scope of this “preclearance” requirement, and the act included a provision for states to “bail out” of requesting approval for changes if they had not discriminated against voters of color or non-English-speaking voters for 10 years. Voters in those states and localities to which Section 5 applies will now have a harder time protecting their right to vote, thanks to the U.S. Supreme Court’s June 25, 2013, opinion in Shelby County v. Holder. The Court ruled that Section 4’s method for determining which jurisdictions have to seek preclearance is unconstitutional because, in Chief Justice John Roberts’s words, it is “based on decades-old data and eradicated practices.” The majority opinion by Chief Justice Roberts faults Congress for basing Section 5’s coverage on the “history of voting tests and low voter registration and turnout” in 1965. He argues, “Today the Nation is no longer divided along those lines, yet the Voting Rights Act continues to treat it as if it were.” The majority did not ignore the voluminous record of voting discrimination that Congress compiled when it repeatedly reauthorized the act, but Chief Justice Roberts dismisses the record as failing to show “anything approaching” the type of discrimination that “clearly distinguished the covered jurisdictions” in 1965. Justice Clarence Thomas wanted the Court to clearly strike down Section 5 as unconstitutional, arguing that declining to do so “needlessly prolongs the demise” of Section 5. 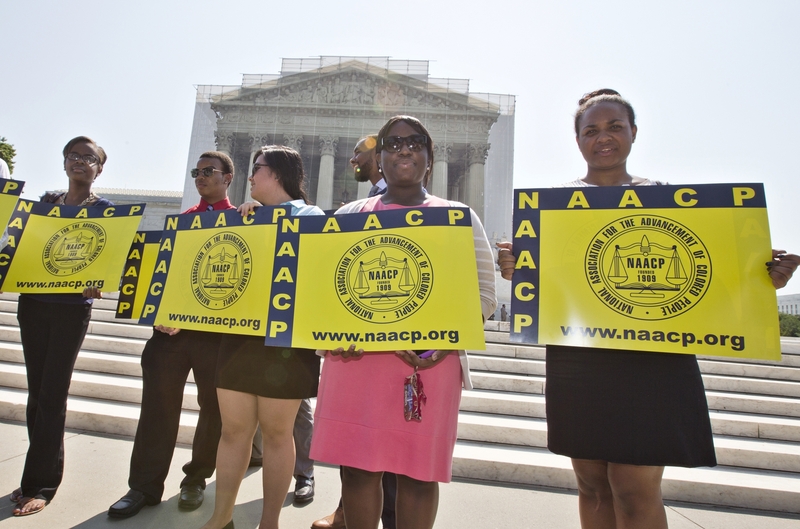 Because of the Court’s decision, discriminatory voting laws can only be challenged under the act through litigation. In her Shelby County dissent, Justice Ginsburg says the Congress that passed the Voting Rights Act “learned from experience that laws targeting particular electoral practices or enabling case-by-case litigation were inadequate” to protecting voters of color. “Litigation occurs only after … the illegal voting scheme has already been put in place and individuals have been elected pursuant to it, thereby gaining the advantages of incumbency.” This means that our courts will assume an even more critical role in protecting voting rights. Republican legislators in several states are seeking to pass laws that would disenfranchise minorities, and now that the Department of Justice is no longer preclearing voting laws, the courts could become most important institution in protecting voting rights. This means that the composition of state and federal courts matters a great deal for voting-rights advocates. Legislators and election administrators formerly subject to preclearance could erect more obstacles to voter registration or casting a ballot. In 2013 alone, state legislatures considered more than 80 bills that would limit voting opportunities, according to the Brennan Center for Justice. Republicans in North Carolina gained control of the state government in 2012 for the first time since 1896, and their effort to restrict the right to vote is now in full swing. Republican legislators in the Tar Heel State are considering a bill that would impose a tax on parents whose college-student children register to vote in the city or town where they attend college. North Carolina legislators are also considering bills to make voter registration more difficult, end same-day voter registration, make it harder for ex-felons to vote, reduce early voting, and end early voting on Sundays. Similar efforts are underway in scores of state legislatures, including several jurisdictions that were previously required to preclear their voting laws. Despite the Supreme Court’s refusal to acknowledge the continuing need for preclearance, there are real and meaningful opportunities for change between now and the next election. Voters are waking up to the problems surrounding our voting system. State legislators have introduced dozens of laws to expand access to voting in 2013. Congress can pass an amendment to the Voting Rights Act that sets up a preclearance system that the Court would not rule unconstitutional. In light of President Barack Obama’s creation of a bipartisan commission on voting and nascent efforts in state houses across the country to protect voters, the political will and public sentiment are now on the side of expanding access to the ballot box. The challenge is to harness the energy behind better voting protections today to achieve both short-term improvements and longer-term changes that allow every American to participate fully and equally in our democracy. No conversation about elections in this country can be complete without talking about the critical role courts play. History tells us that all of these laws and policies, whether aimed at protecting voting rights or limiting them, end up being challenged in court. In just the past year, we have seen federal and state courts weighing in on purges of voting rolls, voter ID laws, and disenfranchising gerrymandering schemes. Courts often serve as the last stand against efforts to disenfranchise the same groups of voters that have historically faced discrimination. In light of the Shelby County ruling, the U.S. Department of Justice will no longer preclear voting changes, and civil-rights advocates will have to rely more on litigation, which often cannot proceed until a voter has been discriminated against. As these voter-suppression statutes collide with the constitutional right to vote, the courts are crucial to ensuring that every American’s vote counts. In recent years, federal courts have decided challenges to state laws that relate to the drawing of congressional district lines or require proof of citizenship from voters in federal elections. Federal courts interpret statutes such as the National Voter Registration Act, which requires states to provide more opportunities for citizens to register to vote and establishes a “federal form” for voter registration. The form requires registrants to swear or affirm that they are U.S. citizens, but an Arizona law sought to require additional documentation of citizenship. The U.S. Ninth Circuit Court of Appeals ruled in 2012 that the Arizona law was preempted by federal law, and the U.S. Supreme Court recently agreed. The Court noted that the Constitution grants states the authority to regulate the “times, places, and manner of holding elections” for federal office, but it also allows Congress to “make or alter” those rules. Federal courts often hear challenges to attacks on voting through the application of the Voting Rights Act. Countless efforts to suppress the votes of racial or language minorities have been blocked by federal courts acting to enforce the act. Section 2 of the Voting Rights Act applies all across the United States and prohibits discrimination in voting. The 2012 purge of the voting rolls in Florida was challenged under Section 2, and the case is currently pending in the 11th U.S. Circuit Court of Appeals. Section 2 will likely become more important now that voters are without the protection of the Section 5 preclearance requirement. Sections 4 and 5 were included in the Voting Rights Act because after-the-fact legal challenges to discriminatory voting laws were not effective at preventing the disenfranchisement of black voters in the Jim Crow-era South. Section 5 has helped ensure voters’ access to the polling booth in recent years. If the act had not required preclearance, then the only way to stop these discriminatory voting laws would have been costly and time-consuming litigation. South Carolina sought to implement a strict voter ID law before Election Day 2012, but legislators loosened some of the discriminatory provisions to avoid being denied preclearance. The original version of the law would have impacted South Carolina voters such as 82-year-old Hanna White, who, similar to many older African Americans, is unable to get a state-issued ID because she has never had a birth certificate. Texas passed the strictest voter ID law in the nation in advance of the 2012 election, placing unforgiving burdens on minority voters and other groups. The law would have allowed concealed handgun licenses to serve as a form of valid identification to vote but would have rejected the use of a college ID or a state-employee ID. Fortunately, a federal court blocked the law under Section 5 and saved African American and Latino voters from being disenfranchised in the 2012 election. Georgia would have continued to use a voter-verification program to check the citizenship status of every person seeking to register to vote. Evidence emerged that minority voters were being flagged at higher rates, requiring time-consuming additional steps to prove their citizenship. The Department of Justice denied preclearance for this law in 2009. Despite these successes, the U.S. Supreme Court struck down the act’s formula for deciding which jurisdictions must preclear their voting rules. Now that the Court has struck down a key provision of the Voting Rights Act, voters will have fewer protections against potentially discriminatory voting laws, and their advocates may rely more on state courts to protect the right to vote. Though the U.S. Constitution only contains broad prohibitions on discriminating against certain groups of voters, many state constitutions guarantee more robust and specific rights to vote. The Ohio Constitution, for example, decrees that every resident who “has been registered to vote for thirty days …. is entitled to vote at all elections.” The Michigan Constitution gives the legislature the power to regulate the place and manner of elections, but it guarantees that every resident of six months or more “shall be … qualified to vote in any election, except as otherwise provided in this constitution.” Article VI of the North Carolina Constitution says that anyone who satisfies the state constitution’s requirements for voting “shall be entitled to vote at any election.” State supreme courts, as the final interpreters of these state constitutional rights, are crucial to protecting voting rights. But in many of the states where legislators are working hardest to restrict the right to vote, the state Republican Parties have also spent millions of dollars to make sure conservative judges control their high courts. Many of these states are considered “swing states” in federal elections but have legislatures that are firmly controlled by Republican legislators. The state Republican Parties have spent heavily on judicial races in these states to ensure that the judiciary does not stand in the way of advancing their agenda. If those voters, however, looked to the Michigan Supreme Court for help, it would find a court shaped by millions of dollars from the state Republican Party. According to the Michigan Campaign Finance Network, the party spent $6.7 million—more than any other group—to elect Republicans to the high court in 2012, and only a tiny fraction of this sum was reported under state campaign finance laws. During the 2010 highcourt race, the Michigan Republican Party spent $4.7 million, twice as much as the state Democratic Party. A public-financing system in place since 2004 had largely succeeded in keeping special interest money out of North Carolina Supreme Court elections, but independent spending overwhelmed the system last year. The 2012 election was dominated by independent-group spending that ran ads for Justice Paul Newby, the conservative incumbent. Several organizations spent around $2.5 million to help the incumbent keep his seat, and nearly half of this money came from just one source: the Republican State Leadership Committee. Why did the committee feel so compelled to keep Justice Newby on the bench? The committee had helped the Republican-led North Carolina legislature draft its recent redistricting map, and during the 2012 election, those maps were being challenged in a lawsuit by civil rights groups alleging that the drafters disenfranchised black voters by using race as a proxy for political party. While this case was pending before the North Carolina Supreme Court, the same Republican group that allegedly discriminated against black voters contributed around $1.2 million to keep a 4–3 conservative majority on the court. In 2012, at the same time Florida Republicans were purging voter rolls and making it harder to register voters, the state Republican Party engaged in an unprecedented campaign to unseat the three justices on the Florida Supreme Court who were appointed by Democratic governors. As The New York Times noted, Florida’s merit selection and retention election system was “widely praised and largely free of politicking,” until the opposition campaign in 2012. Republicans decried the court’s “judicial activism,” but a study by the conservative Federalist Society concluded that “there does not appear to be a pattern of unprincipled decision-making by any of the justices.” The justices’ true crime was frustrating some of the most extreme goals of Florida’s Republican governor and legislature. The Ohio Supreme Court in 2004 faced a lawsuit challenging a plan by Republicans to deploy “challengers” to certain voting precincts to challenge the qualifications of voters under state law. The plaintiffs claimed that the challengers would target black voters, who would be “intimidated” and “blocked from exercising their right to vote.” Days before the election, two federal district court judges had ordered that all challengers stay away from the polls (though this decision was later overturned by the 6th U.S. Circuit Court of Appeals). On November 1, 2004, the same day as the two federal district court opinions, the five Republicans on the Ohio Supreme Court ordered the secretary of state to allow the challengers to proceed with their plan. In dissent, the two Democratic justices argued that issuing the order “on the eve of the election” robbed the plaintiffs of the opportunity to challenge the state law that permitted challengers at the polls. The dissent warned that the presence of challengers could result in “chaos and a level of voter frustration” that could cause qualified voters to turn away from the polls. As the Ohio Supreme Court was considering this lawsuit, the campaigns of three Republican justices were raking in big money from the political party that would benefit from challenging black voters. The Ohio Republican Party was the largest donor in the 2004 high-court election, giving more than six times the amount donated by the second largest contributor, the state Democratic Party. State and local Republican groups donated more than half a million dollars, compared to nearly $70,000 from Democrats. One Republican justice received more than $200,000 from the state party, including one donation on the day before the court’s decision allowing challengers at polling places. Now that the preclearance formula for the Voting Rights Act is no longer valid, voting-rights advocates will have to rely more on litigation to challenge discriminatory voting laws. Anyone who cares about the right to vote must concern themselves with the courts. Who sits on state and federal courts matters for anyone looking to protect the right to vote. Without preclearance, Section 2 may become more important to protecting voting rights through federal courts, where conservatives have been successful at putting conservative judges on the federal bench. State supreme courts, as the final interpreters of broad constitutional voting rights, may also play a larger role in the wake of the Shelby County ruling. But at the same time that Republican legislators are pushing anti-voting laws, big business groups and state Republican parties are dominating election spending for high-court races in many key states. Acting with blatant political motivations, Republican politicians are pushing laws that would keep citizens from participating in our democracy, and our courts can stop them. If progressives want to protect the rights of voters, they must push to have judges who share their values appointed to the federal bench, and they must support judicial election reforms that will help keep one political party from dominating all three branches of state governments. Andrew Blotky is the Director of Legal Progress at the Center for American Progress. Billy Corriher is the Associate Director of Research for Legal Progress at the Center for American Progress.